And the next big thing for 2019 is…. RECRUITMENT TRENDS 2019: WHAT’S NEW? What’s been recruitment professionals’ biggest challenge in 2018? And, how are they planning to solve this in the coming 2019? Are recruitment professionals planning to invest in recruitment technology in 2019? Is collecting more candidate data on their agenda? And, of course, what’s the next big thing for 2019 in the world of recruitment, according to your fellow recruiters? Is it AI? Big data, maybe? Automated sourcing? 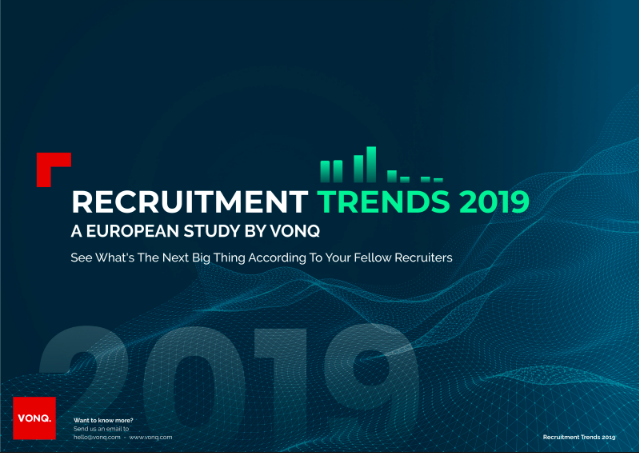 To offer you the best summary on what’s worked in 2018 and what’s coming up in recruiting in 2019, we’ve asked your fellow recruiters all across Europe and gathered their insights in the European Recruitment Trends 2019 Study by VONQ.